Mithali Raj becomes highest run-scorer in T20 innings leaving Virat and Rohit behind: Mithali Raj is a devoted sportsperson of Indian women’s cricket team and has received many awards in every format in her career. In past few days, the veteran cricket player has made many records. She has now become the T20I highest run-scorer and has also surpassed New Zealand’s Martin Guptill, who is the highest run scorer in T20I of men’s cricket. On Thursday, she accounted two more awards to her collection. However, she is still the 4th highest T20I run-scorer in the world, following Suzie Bates (2961), Stafanie Taylor (2691) and Charlotte Edwards (2605). India scored 146/6 against Ireland on Thursday tournament where Mithali Raj herself scored 51 runs. Ireland struggled to score 146 runs and managed to score 93/8 runs. The match was held at the providence stadium in Guyana. Mithali Raj (51) and Smriti Mandhana (33) forged a 67-run opening wicket stand to get India to a good start. Later, Jemmimah Rodrigues (18) and Deepti Sharma (11 not out) scored quick runs to help India post a decent total. After this win, Indian women’s cricket team has qualified for the semi-finals. “I’m sure my knee will get better. Today the wicket was quite challenging. The pitch was soft. And playing slower bowlers was difficult, but the partnership with Smriti was crucial.” she said after the Innings. The ICC Women’s World T20 2018 is being hosted in the West Indies from 9th to 24th November 2018. Total 19 teams are taking part in The ICC Women’s World T20 tournament 2018. Semi-Final match is going to be held on 17th November 2018 between India and Australia at Guyana national stadium, providence. Mithali Raj, 35-year old right handed batswomen is an Indian women’s cricketer and the captain of the Indian women’s cricket team in Tests and ODI. She is considered as one of the ultimate batswomen to have ever played in the history of Indian women’s cricket team. She is the only female cricketer to exceed the 6,000 run mark in WODIs and also the highest run-scorer in women’s international cricket. She is the first player to score 7 sequential 50s in ODIs. She also made the record of most half-centuries in Women’s ODIs. 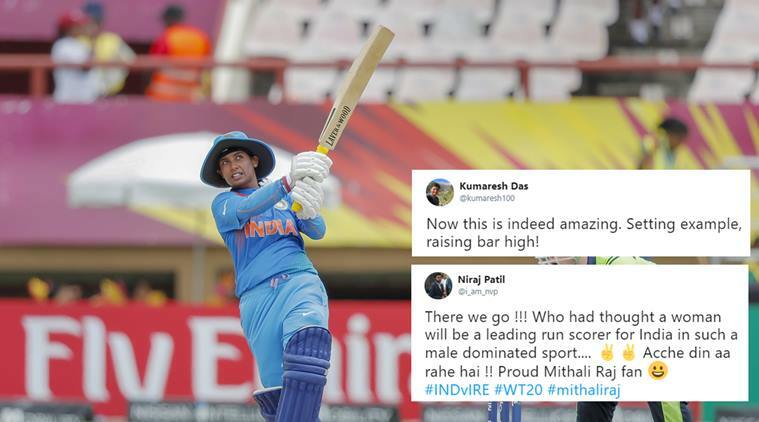 Mithali Raj became the first player from India to score 2000 runs in T20Is in June 2018 during the 2018 Women’s Twenty20 Asia Cup. She also became the first woman cricketer to reach 2000 T20I runs and set the new milestone for other cricketers.